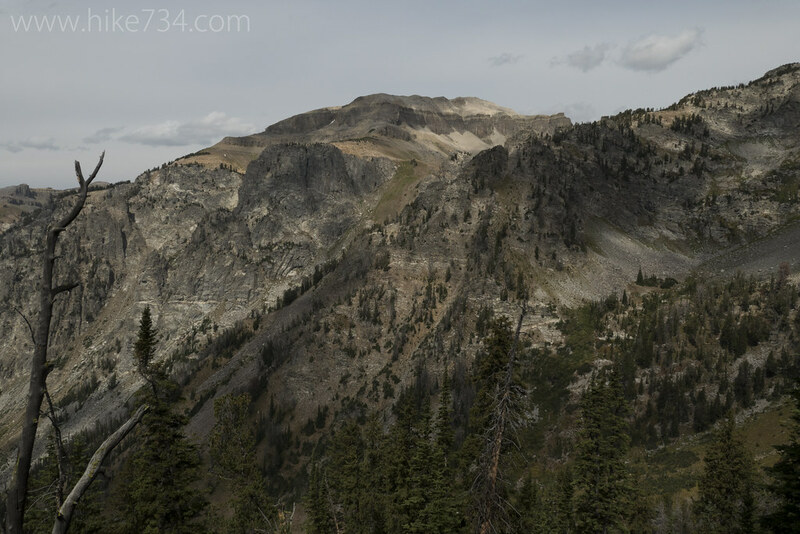 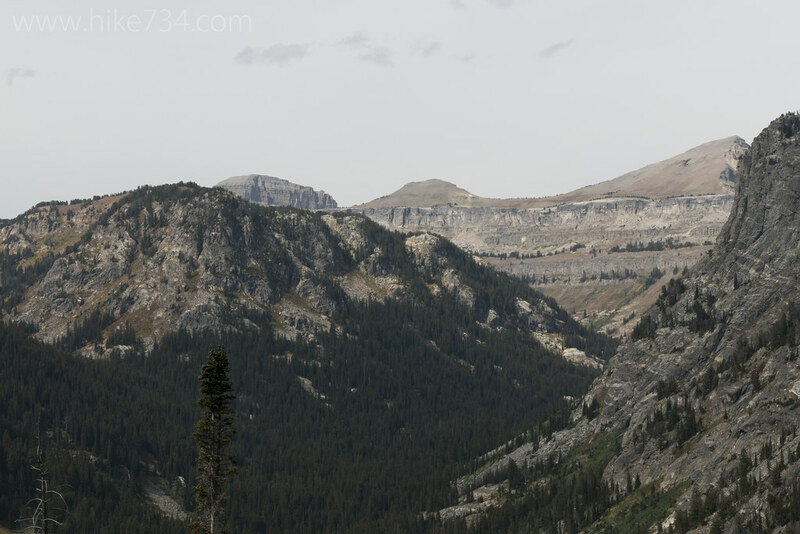 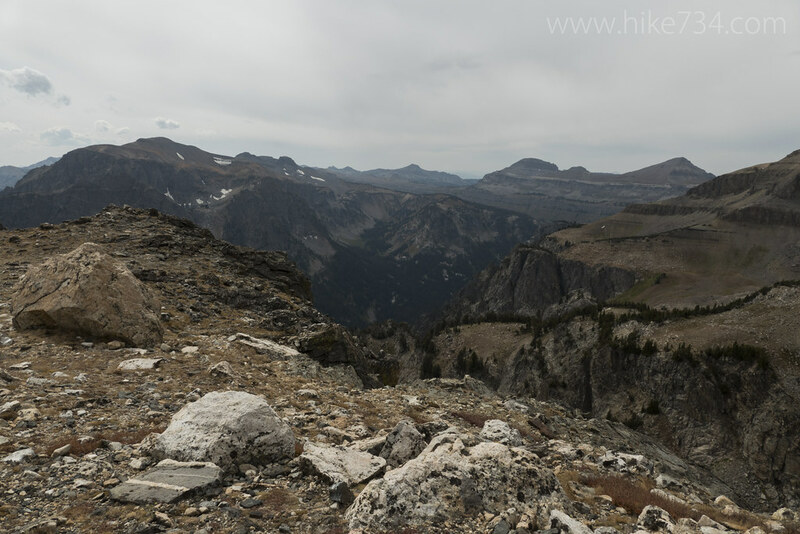 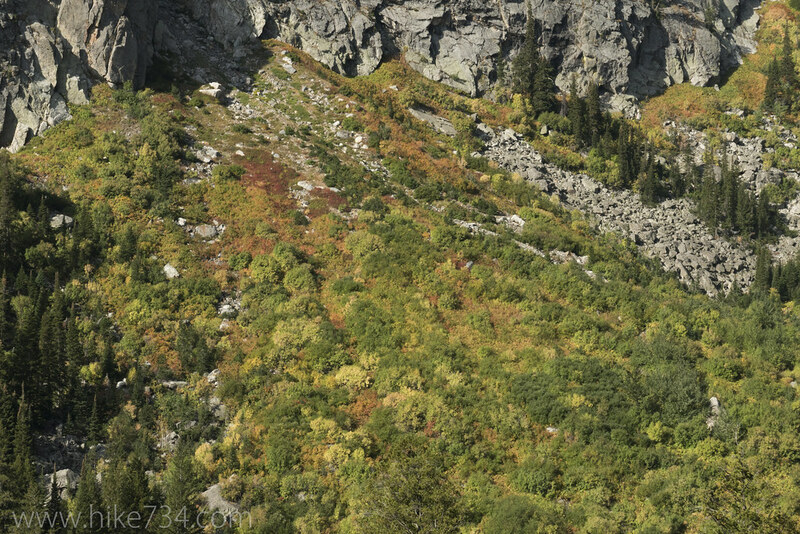 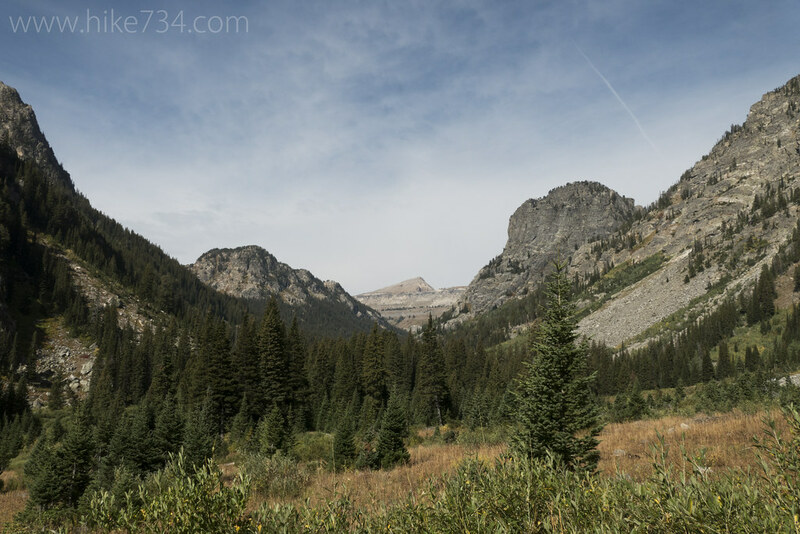 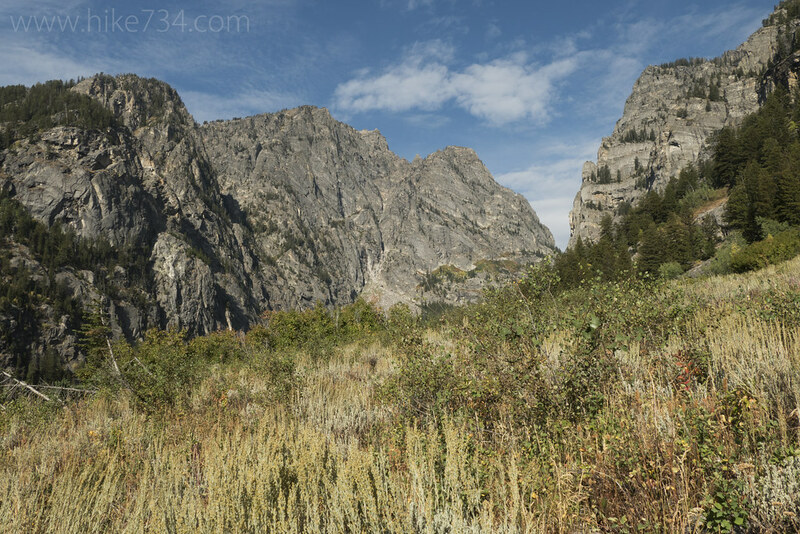 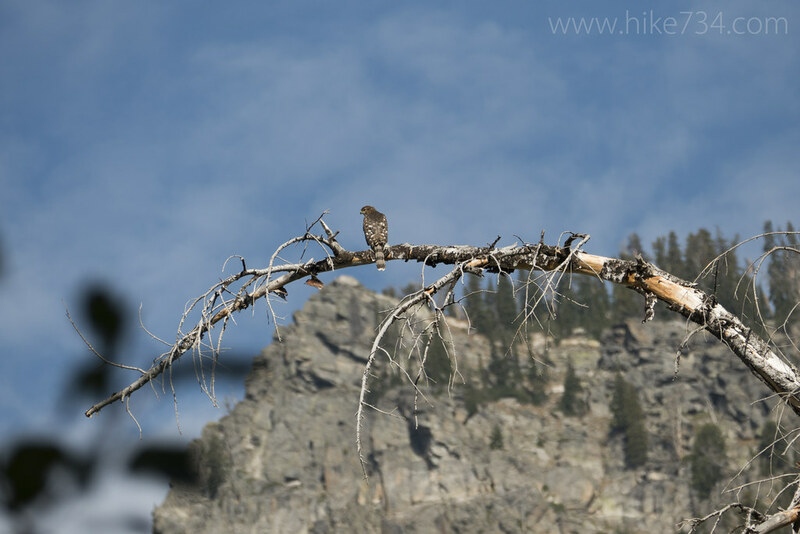 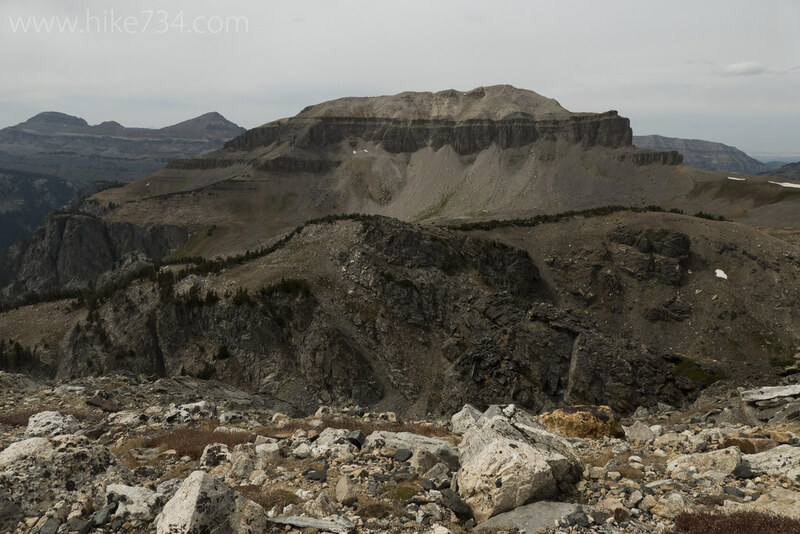 The hike up to Static Peak Divide in Grand Teton National Park gives you breathtaking views of Phelps Lake, takes you through the stunning Death Canyon, and delivers breathtaking views as you near the divide itself. 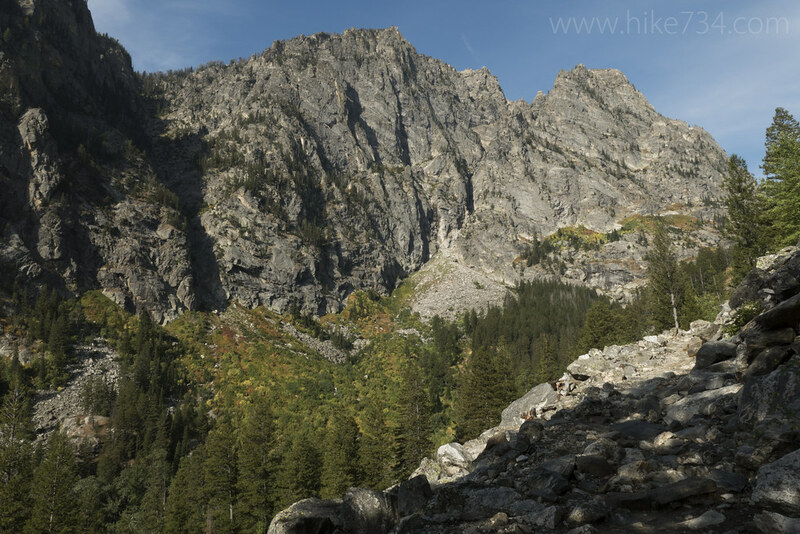 If you make it up to Static Peak Divide, and you have a little bit of extra energy, consider taking the climber’s trail from the divide up to Static Peak for more rewarding vantages. We bounced down the super rough road to the Death Canyon Trailhead. 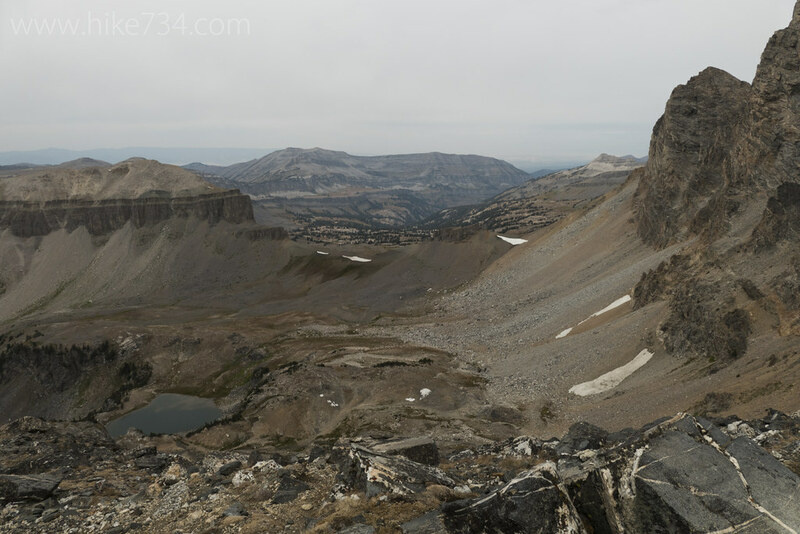 The rounded rocks of the moraine create a nasty road, but it’s worth it if your car can make it (otherwise, you just walk the roughest section). 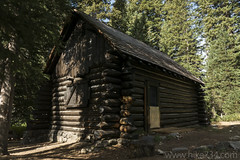 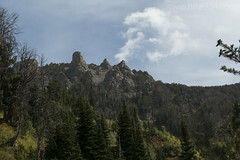 Once at the trailhead, the crisp, fall air and blue skies greeted us. 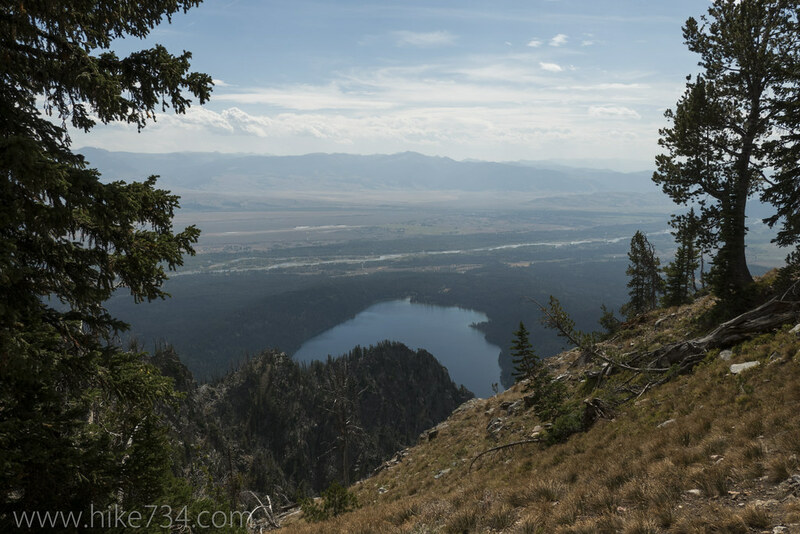 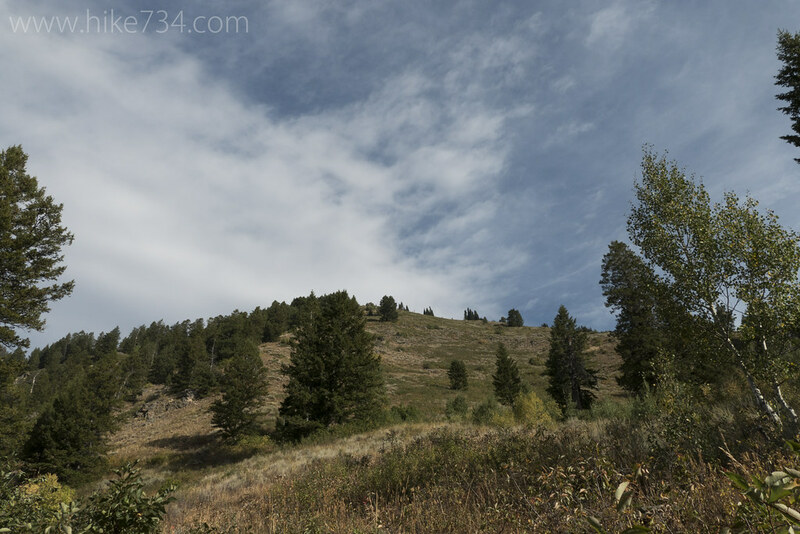 We stepped onto the forested trail and began climbing towards Phelps Lake Overlook. 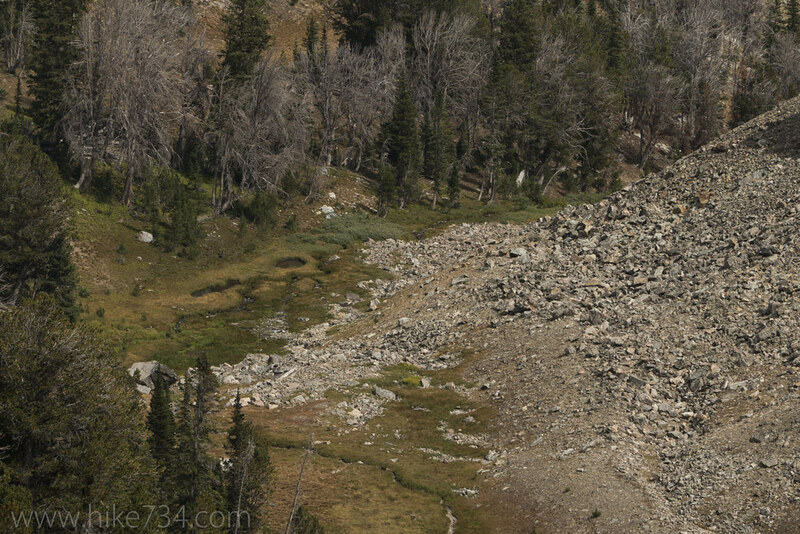 The meadows broke up the forest, giving us views up towards the jagged ridgelines. 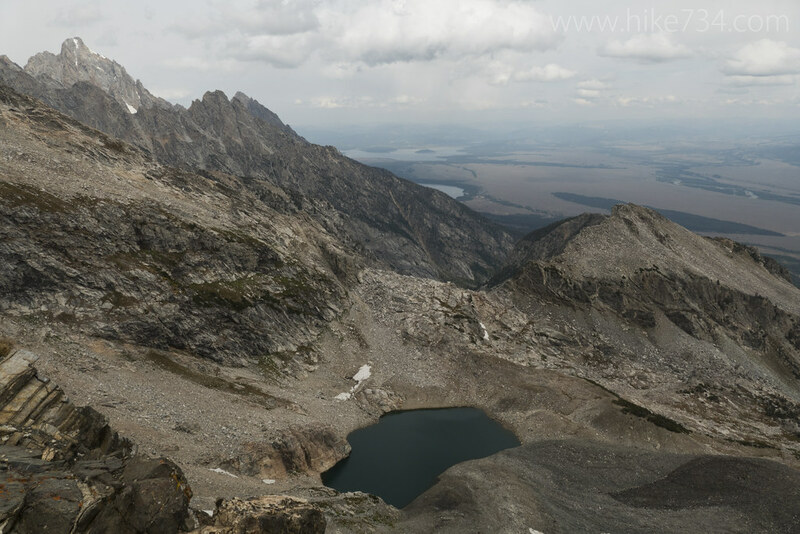 Once on the moraine that hems in Phelps Lake, we were rewarded with a breathtaking view of Phelps Lake. This calm morning had a mirror finish on the lake. 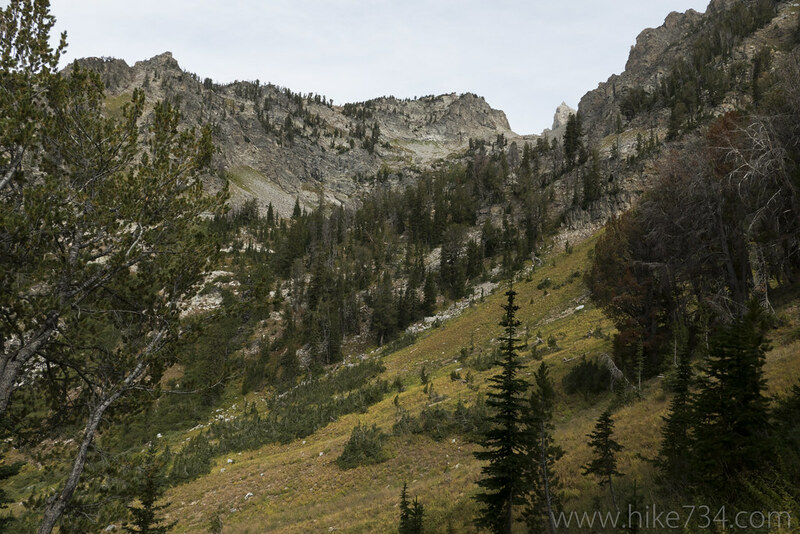 To our right, the tall walls of Death Canyon beckoned, so we switchbacked down towards the lake. 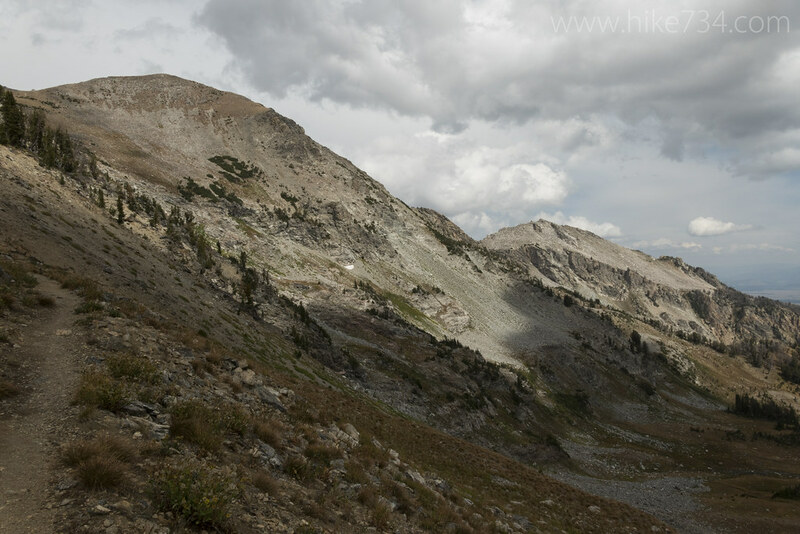 As we descended, we passed through more meadows, avalanche chutes, and pockets of aspens and huge Douglas fir trees. 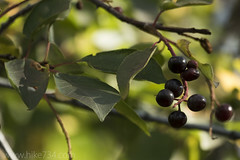 American Robins were gorging themselves on the chokecherries while a juvenile Sharp-shinned Hawk hunted for a meal. 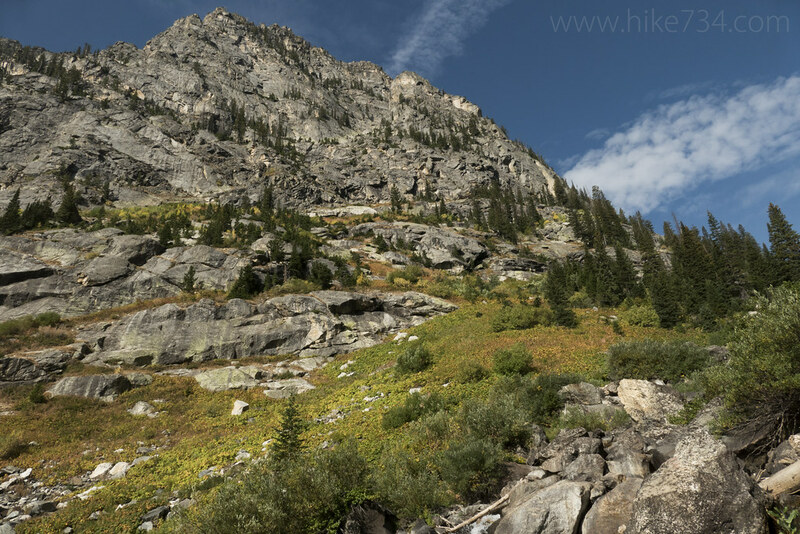 We stayed to the right at the junction with the spur trail to the Phelps Lake Loop and came along the unnamed creek that cascades out of the canyon. 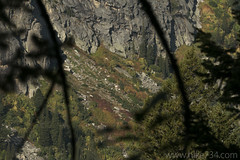 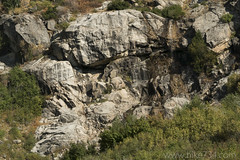 We began climbing through the lush undergrowth, but it didn’t take long to break out into views of the canyon. 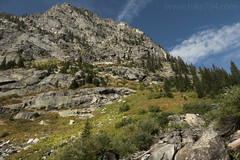 The mammoth walls of the canyon enclosed the massive boulder fields and the creek that was trickling through them. 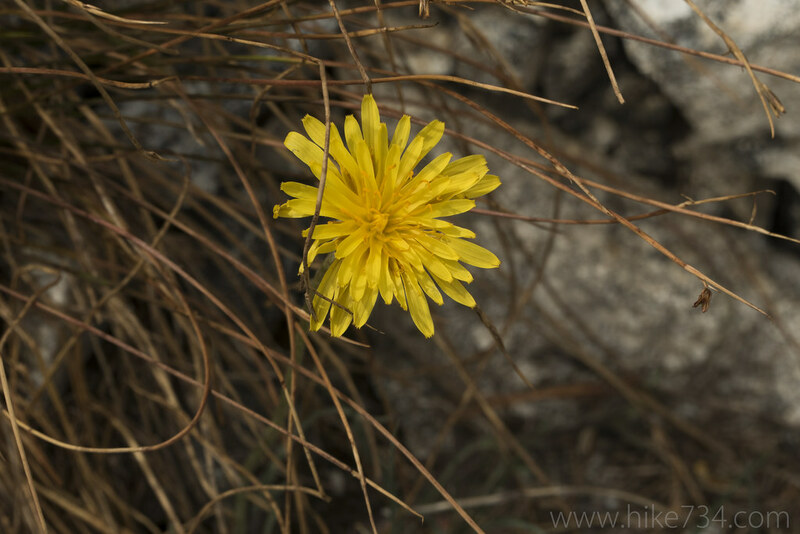 Every fall color was represented in the bushes that carpeted the canyon’s floor. 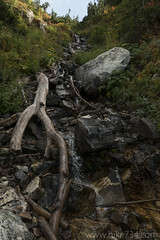 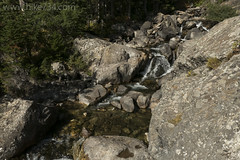 We switchbacked up, eventually coming alongside the stunning creek which cascaded over and around the boulders. 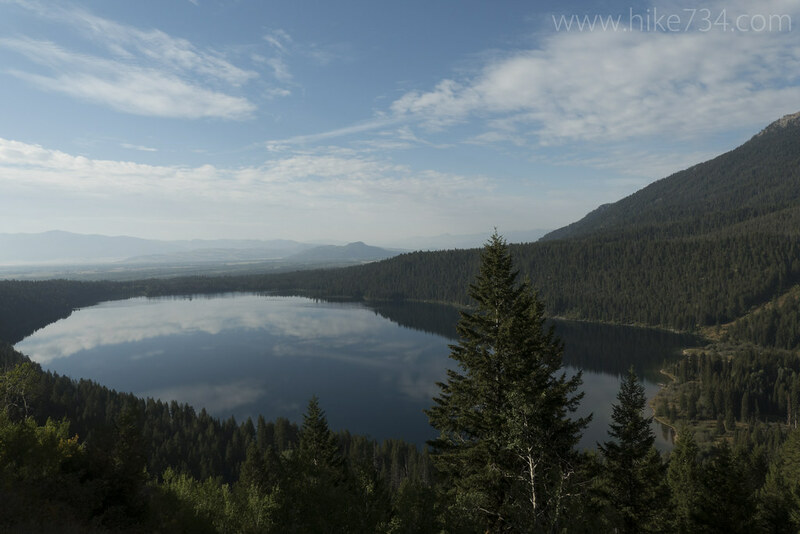 Along the way, we looked back at Phelps Lake sparkling in the morning light. The trail suddenly eased and the creek turned into a calm, meandering affair as the canyon opened up. A patrol cabin serves as a nice spot to turn around, or one could continue up the level canyon, exploring the riparian areas along the creek while gazing up at the jagged ridgelines. 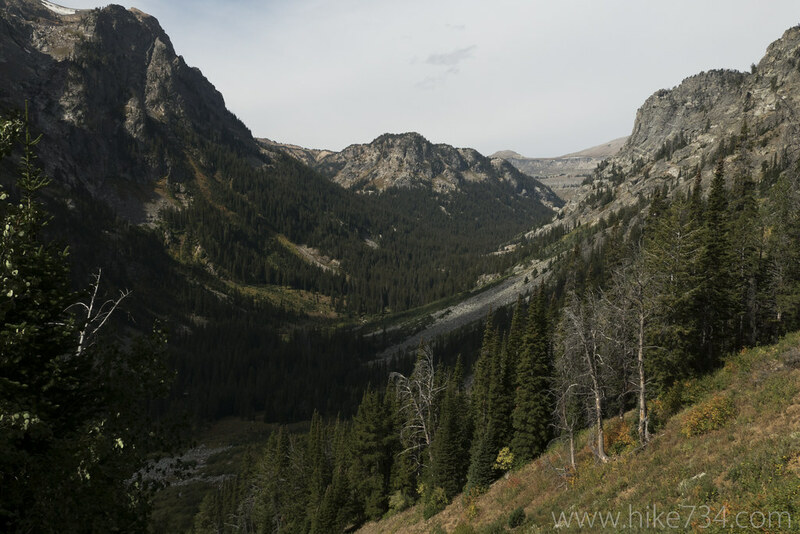 Our plan, however, involved exploring those ridgelines, so we took a right at the fork and began climbing again. 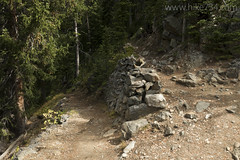 The trail worked its way up through more alternating meadows, aspens, and pines. 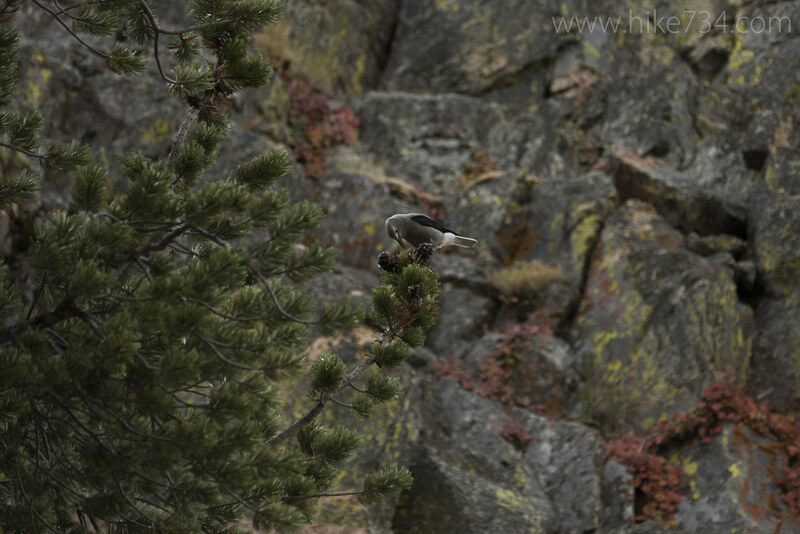 The higher up we got, the more sub-alpine the foliage including the splendid white-bark pine with Clark’s Nutcrackers noisily calling out and harvesting seeds. Views looking up the canyon with its broad, glacially-carved U-shape stretched out below us. 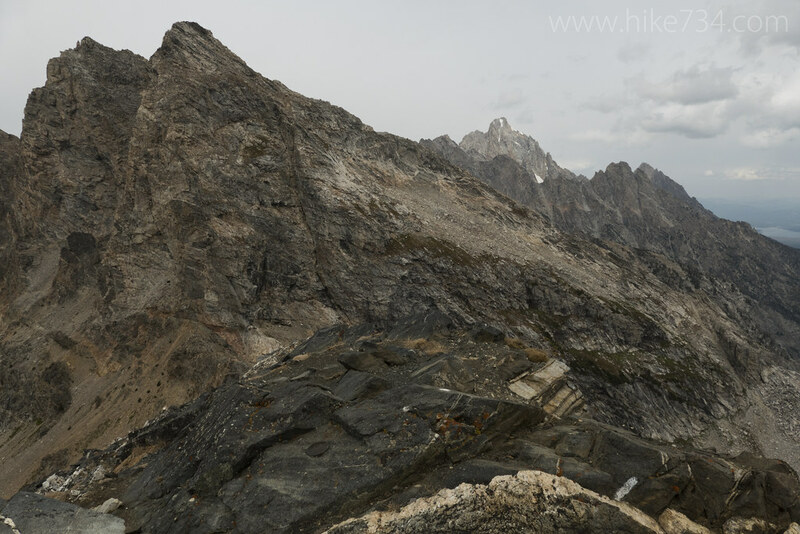 Summits popped in all directions with more showing up as we gained elevation through a generous collection of tight switchbacks. 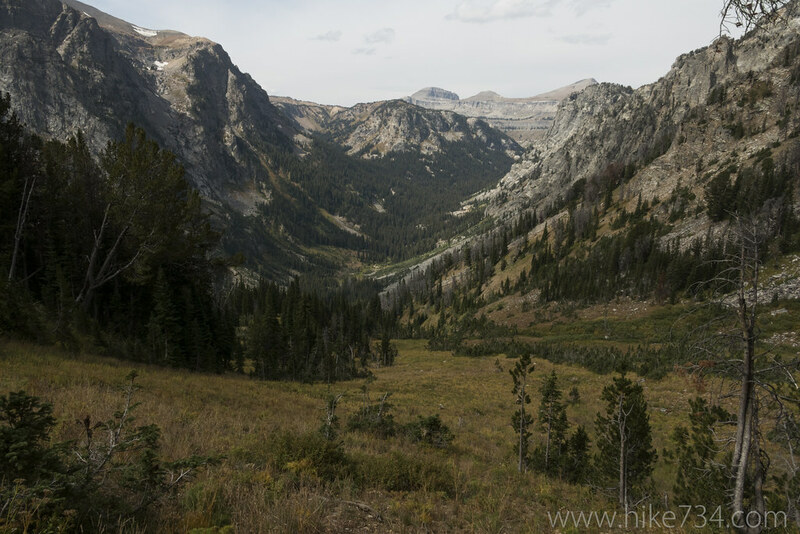 Eventually, the trail crested on the ridge and we were able to see on the east side of the ridgeline once more. 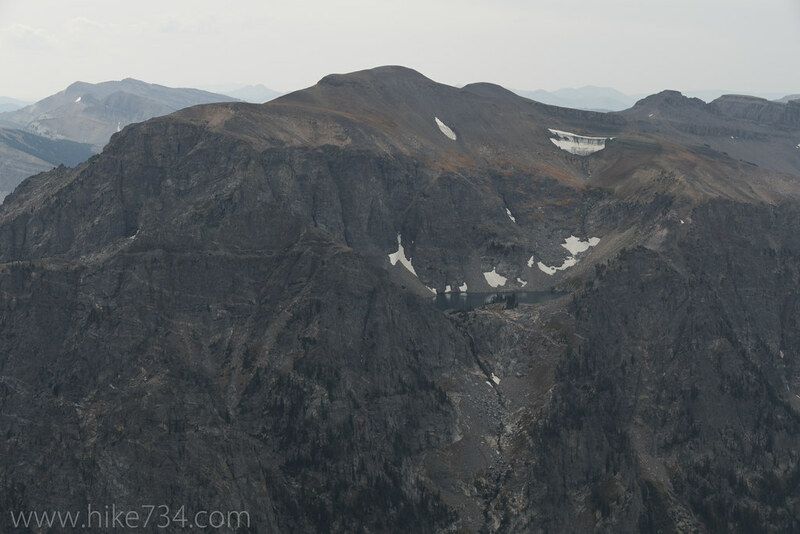 We had a bird’s eye view of Phelps Lake, now thousands of feet below us. 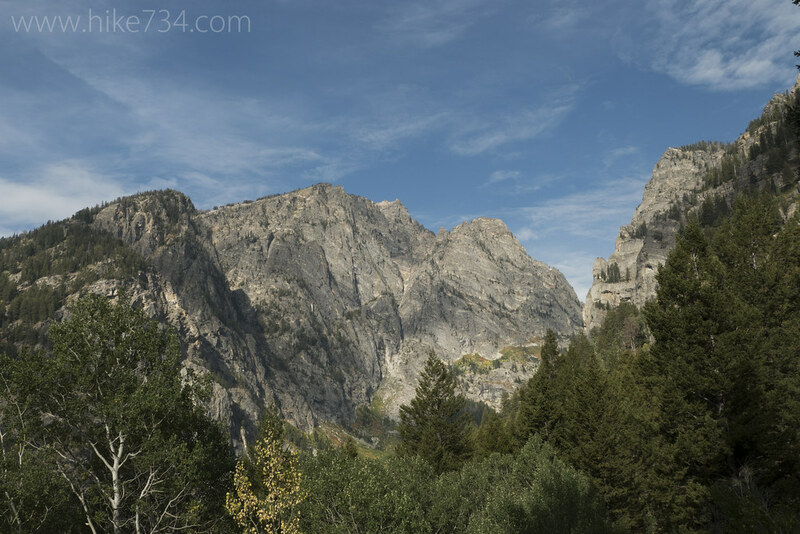 The vantages were incredible and constant. 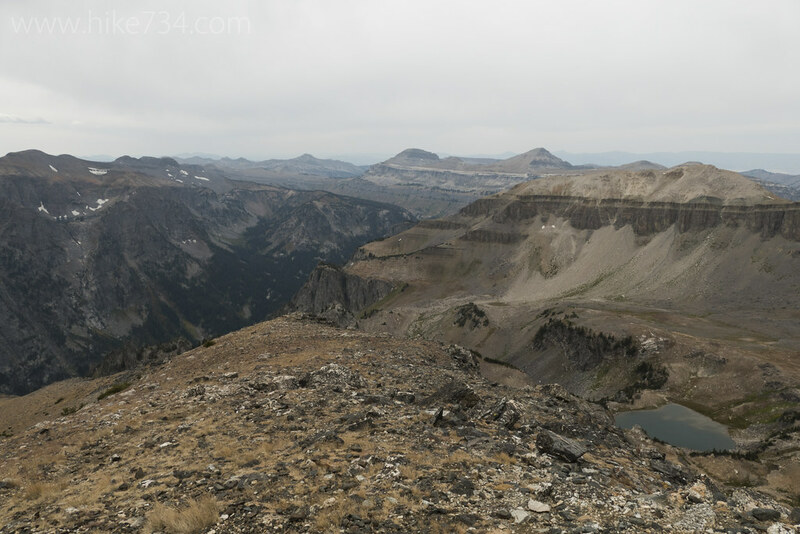 Rimrock Lake tucked high up on Prospectors Mountain came into view as we moved along the ridgeline. 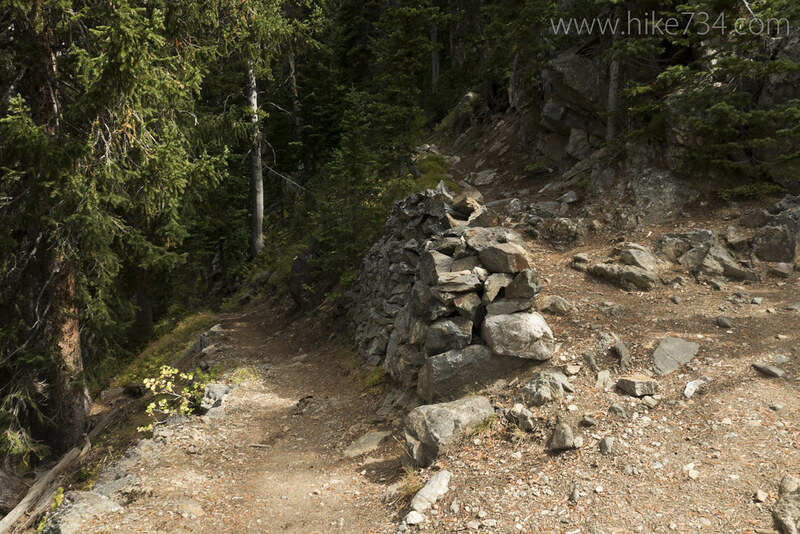 One more set of switchbacks brought us up to the signed Static Peak Divide. 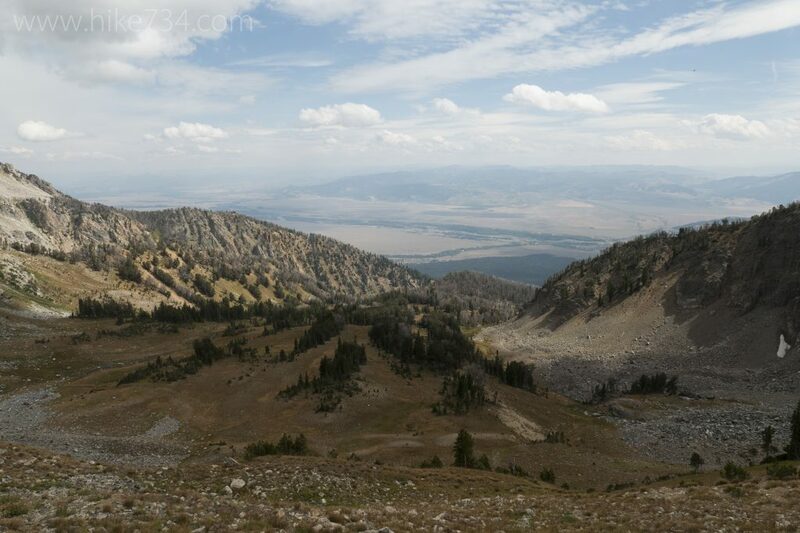 From there, you have great views looking both east and west. Alaska Basin became visible to the northwest. 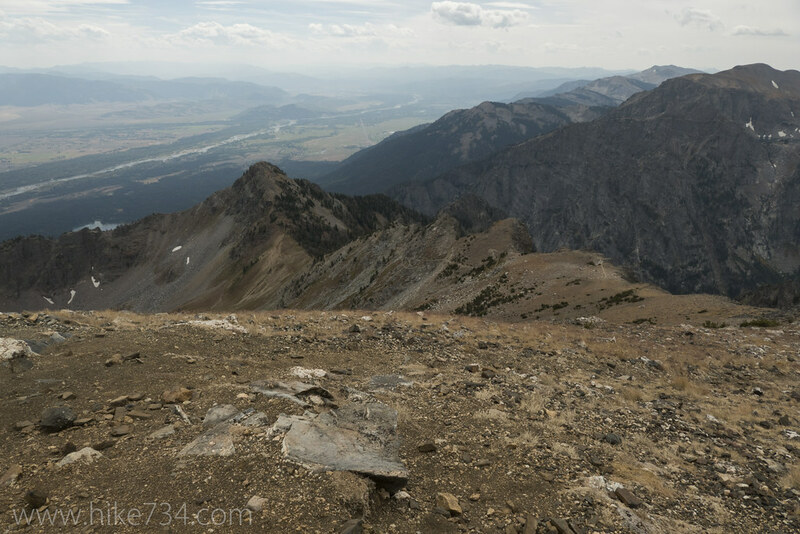 Static Peak itself is a humble summit looking down on the divide and we figured that we’d climb the extra 500ft or so since we were there. The extra effort was worth it. Timberline Lake was tucked below Buck Mountain, backdropped by Grand Teton. 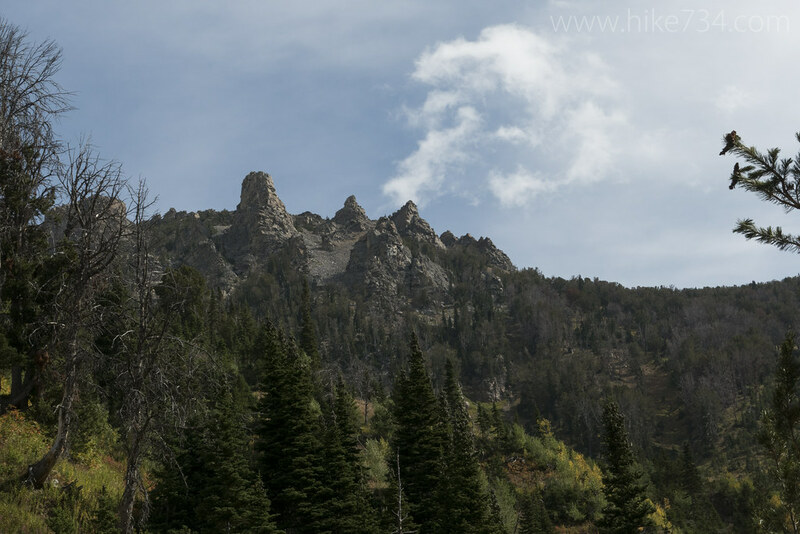 We had lunch, enjoyed the views, then headed back down through the fall colors and few remaining flowers back to our car… and the bumpy road out.